I now find myself in this age-group and so are many of my students, even my regular yoga teacher is an octogenarian! Yoga is accessible to everyone and it’s never too late to start yoga. All the yoga postures can be modified to suit each individual’s level of experience and ability. I encourage and provide all the equipment my students need to start practising yoga, with blocks, belts, cushions, blankets, foam rollers, etc., to assist in student’s safe practise and comfort. The majority of my students in this age category feel the benefit often inspiring them to develop a regular home practise too. This ‘Adventure’ we call life can often be challenging as we find ourselves adapting to challenges and changes. I’ve personal experience of caring for elderly family members/friends with a variety of health issues and know how difficult this can be, having experienced it to the detriment of my own health. I’m sure we all have been affected by Dementia, Heart Disease, Cancer, etc., either directly or indirectly. Inevitably as we age we are often faced with the death of loved ones and this can take its toll on our wellbeing both mentally and physically. Yoga affects all the systems of the body, improving circulation, increasing flexibility, strength, stamina and balancing the endocrine and nervous system. It can be beneficial when faced with the menopause and its vast range of symptoms. The practise of Yoga can also help us manage the symptoms of sleeplessness, digestive problems, pelvic floor issues e.g. uterine/bowel/bladder prolapsed or erectile dysfunction; arthritis, osteoporosis, anxiety, depression, panic-attacks. 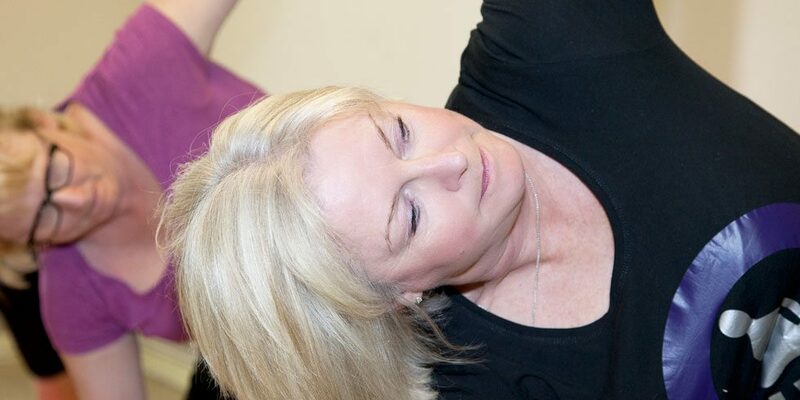 We also enjoy a fun social aspect in my yoga classes with lots of laughter in a relaxed, supportive environment. Many students are happy to share their stories of how yoga has helped them cope and recover from injury, surgery, bereavement, life-changes. Our Christmas parties (yes we enjoy at least 2) are quite spectacular and enjoyed by so many of my students past and present. We also have occasional ‘one-off’ events throughout the year with trips to the cinema, theatre, a birthday celebration, go-karting, indoor surfing, to name but a few. Why not come along and give yoga a try? It’s never too late to try something new!